The 2017 Global Peace Index yields some unexpected results. Global peace is improving on average, but we are witnessing the growth of ‘peace inequality’ between the most and the least peaceful countries. In a small turnaround, this year’s Global Peace Index (GPI), produced by the Institute for Economics and Peace, finds that the global level of peace has slightly improved, by 0.28 per cent, over the past year, with 93 countries recording higher levels of peace and 68 recording deteriorations. 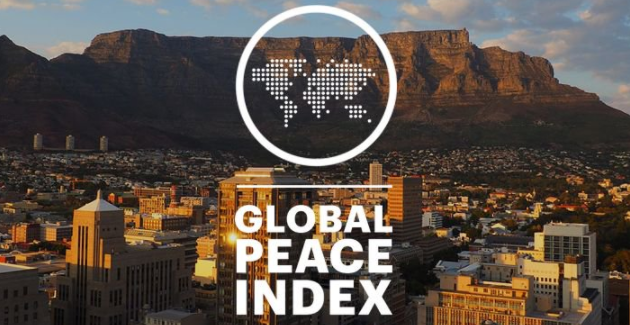 The GPI uses 23 qualitative and quantitative indicators from highly respected sources to rank 163 independent states and territories according to their level of peacefulness. It covers 99.7 per cent of the world’s population. 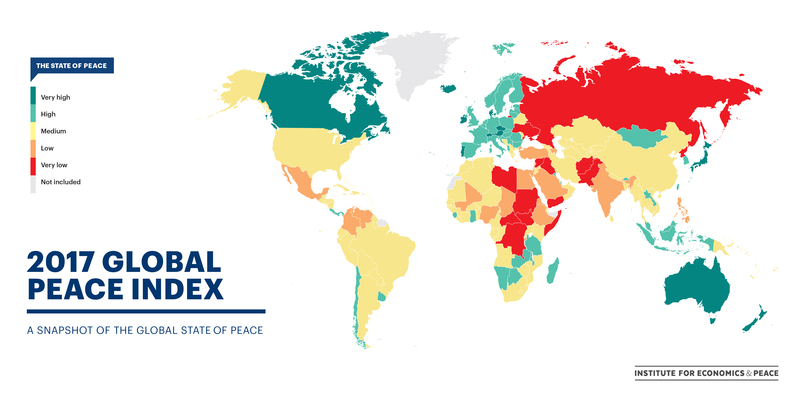 The index assesses global peace under three broad themes: the level of safety and security in society; the extent of domestic and international conflict; and the degree of militarisation. The recorded improvements are largely due to improvements in the average scores for many of the indicators related to safety and security in society, and militarisation. Safety and security improved due to many countries recording lower levels of political terror and lower homicide rates. Several indicators of militarisation improved, most notably military expenditure as a percentage of GDP, the number of armed services personnel per 100,000 people, and nuclear and heavy weapons capabilities. The year’s most important positive development was the improvement in political terror, which was apparent in all regions except sub-Saharan Africa and the Middle East and North Africa (MENA). Unsurprisingly, the MENA region remained the least peaceful region in the world for the fifth year in a row. MENA’s score worsened slightly because of ongoing conflicts in Syria and Yemen, which have involved both international actors and numerous other countries in the region. The largest regional deteriorations in score occurred in North America, which was followed by sub-Saharan Africa and MENA. The deterioration of peace in the US more than offset a mild improvement in Canada. The US score has been dragged down by two indicators: the level of perceived criminality in society and the intensity of organised internal conflict. Homicide rates also recorded a deterioration in the US while the impact of terrorism increased on the back of multiple terrorist attacks in 2016, most notably the Orlando nightclub shooting, in which 49 people were killed. South America registered the largest improvement. South America’s score benefited from improvements across all three domains, with particularly strong gains in societal safety and security. Significant improvements occurred in Guyana, Argentina and Paraguay, each of which recorded fewer incidences of violent demonstrations, lower levels of political terror and a greater degree of political stability. Europe remains the most peaceful region in the world, with eight of the 10 most peaceful countries coming from the region. However, while 21 of the 34 countries improved, the average peace score did not change notably due to the substantial deterioration in Turkey, the impact of the terrorist attacks in Brussels and Paris, and deteriorating relations between Russia and its Nordic neighbours. Looking closer to home, Australia and New Zealand have recorded consistently high levels of peace since the inception of the GPI, and this year they both improved in peace once again, rising to occupy ranks 12 and two respectively. Both countries reported lower levels of external conflict following the completion of the UN-mandated International Security Assistance Force (ISAF) and subsequent troop withdrawal from Afghanistan. Australia also reported fewer imports and exports of weapons. The impact of terrorism declined in both countries. The 2017 GPI found that the economic impact of violence on the global economy in 2016 was US$14.3 trillion (AU$19.3 trillion)—12.6 per cent of world GDP. While still staggeringly high at US$1,953 for every person in the world, this represents a slight (3 per cent) decrease from 2015 and is the first such reduction since 2011. On average, the cost of violence reaches 37 per cent of GDP in the 10 least peaceful countries, compared to only 3 per cent for the 10 most peaceful. Syria remains the least peaceful country for the fifth year running, having fallen 64 places since the index began—the largest decline of the past decade. While the 2017 GPI recorded slight improvements in peace since last year, the index records a less peaceful world over the past decade. Since 2008, the global level of peace has deteriorated by 2.14 per cent, with 80 countries improving while 83 countries deteriorated. Worryingly, we are seeing a growing peace inequality: the GPI shows that the difference in score between the least peaceful and most peaceful countries has been increasing. Although this year’s improvement is mildly reassuring, the world is still struggling to achieve peace, with conflict in the Middle East, political turmoil in the US, large refugee flows and terrorism in Europe. Combined with the increasing level of peace inequality, further improvements to global peace are not guaranteed. Click here to read the full 2017 report and explore the interactive maps. Camilla Schippa is director of the Institute for Economics and Peace, which produces the Global Peace Index each year.